The photo is courtesy of Bulloch County. 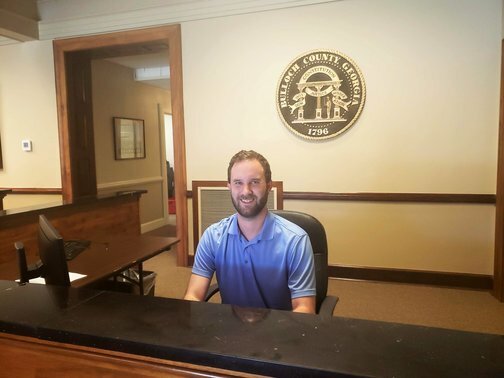 Jonathan Bush, an MPA student at Georgia Southern University, interned with the Bulloch County Manager’s Office during the summer. Through his internship, Bush learned about the day-to-day operations of county government and gained exposure to new ideas and terminology. During the course of his internship, Bush was able to help research and draft human resource policies and gather data for developing the county’s comprehensive plan. He was also tasked with updating the county website. The most successful accomplishment for Bush was drafting the technology policy for human resources. Through his work, he was able to hand the county a draft that could help them jumpstart the process for updating an antiquated policy. Bush’s favorite part of the internship experience was being invited to attend meetings just to listen and learn. Being able to sit in on the meetings allowed him to gain greater insight into county government and how it is all pieced together. He learned a combination of hard and soft skills that go along with managing people, but stated it also taught him how much he still has to learn. To future interns, Bush encourages his peers to seek out this internship as it was a good experience for him and to not be afraid to ask questions. He also advises future interns to talk to people from every department to see what they might want to do in the future. When asked if there was a career in county government for him in the future, Bush answered yes and that the internship further motivated him to pursue this career path.